We were truly honored to have been named one of the hottest small companies in the bioeconomy last year. Genera Energy Inc., a recognized leader in biomass feedstock innovation and supply chain advancements, has been nominated for the 2015 Biofuels Digest 40 Hottest Small Companies in the Advanced Bioeconomy list. An honor previously bestowed to Genera in 2014, the rankings are to be determined by weighted votes from an invited panel of selectors, and from registered subscribers to the digest. For 2015, the rankings will be announced at the Advanced Biofuels Leadership Conference (ABLC)-Next event in San Francisco, November 3. Voting is officially opened now until October 16. Last year, 2014, marked the first year Genera Energy earned the prestigious ranking, landing at number 22 on the Hot 40 list. Criteria for a producer, supplier, investor or partner to earn the recognition is a blend of visibility and credibility within the bioeconomy industry. Committed to excellence in biomass supply chain management and its growing impact on the industry, Genera Energy consistently makes strides for the future of bioenergy and bioproducts – successfully marking them as a “hot” company within the entire bioeconomy. For more information on Biofuels Digest’s Hot Lists or to cast your vote, visit http://www.biofuelsdigest.com/. Biofuels Digest is the world’s most widely read biofuels daily. The Miami, FL-based online magazine and email newsletter published more than 4,000 news stories on bioenergy in 2012, and serves 133,000+ newsletter, website readers and social media followers in every UN-recognized country. For more information, visit http://www.biofuelsdigest.com. 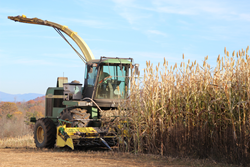 Genera Energy Inc. supplies biomass feedstocks for the advanced bio-based industries, offering scalable industrial scale agriculture biomass supply solutions ranging from full service energy crop production to customizable supply chain solutions and managing biomass supply. Genera’s proprietary Supply ASSURE® feedstock management system and its BIN-SPEC® material handling and milling system offer Genera’s customers maximum feedstock reliability and quality while minimizing variability and cost. Based in Vonore, Tenn., Genera operates the country’s largest and most comprehensive industrial biomass management and processing facility. Focus on innovation and sustainability in delivering industrial biomass supply systems has earned Genera the World’s Biofuels Market’s prestigious 2013 Sustainable Feedstock Innovation Award. For more information, visit http://www.generaenergy.com.